This fifty-eight-foot-long sculpture consists of four offset stainless steel panels installed in a pool of water. Each panel is hand-finished with a non-directional swirl pattern. During the day this pattern refracts the sunlight. At night underwater lights project the pattern of the water onto the stainless steel as waves of light. 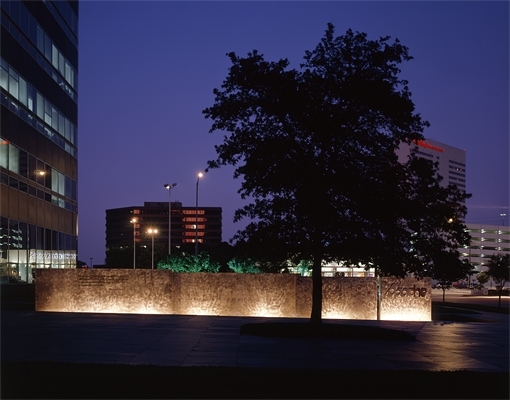 The sculpture is located in the Post Oak Central Office Complex in Houston. It serves the dual purpose of providing a background for the Apache Corporation sign and an enclosure for the entry plaza. The location and height of the sculpture defines the entry to the building by visually screening the entry plaza from a parking lot across Post Oak Boulevard to the east. The sculpture also provides a contrasting visual reference for the oak tree in the center of the plaza. In response to the slope of the adjacent plaza the sculpture steps up as you approach the building thereby enhancing the sense of arrival to the Apache Corporation’s headquarters.